Formulated with European Olive Oil (Olea Europaea) to penetrate and repair the cuticle and the cortex. With controlled sulfonate and sodium carbonate, our exclusive new science in shampoo formulation has a PH of 4.5 to 6. It gives the hair strength, luster and flexibility while controlling damage and split ends, leaving the hair easier to style. This is the ideal formula for the customer with chemically enhanced hair or one who shampoos every day at home to keep the hair in optimum condition. 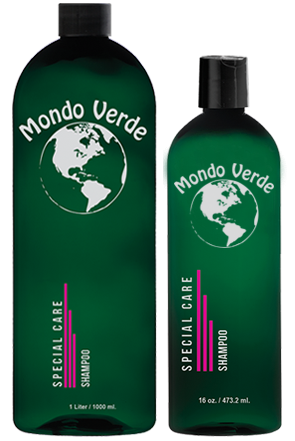 For home use, work Special Care Shampoo into the hair to create a lather. Rinse and repeat. Finish with Mondo Verde Moisture Maintenance. Do not add any other oils or conditioners to the hair.